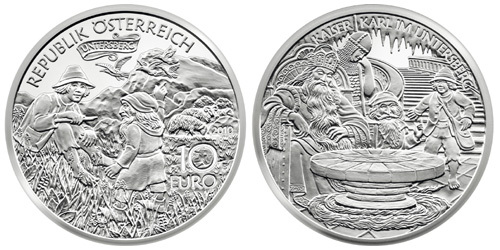 The Munze Osterreich (Austrian Mint) has issued the fourth €10 silver coin in their ongoing “Tales and Legends in Austria” series. This coin tells of the legend of Untersberg in intricate detail. The famous emperor Charlemagne and his army sleep beneath the mountain awaiting the recall to life. The obverse of the coin depicts a shepherd boy being shown the way by a dwarf as he points to the mysterious mountain which the ravens are circling on the slopes of the Untersberg. The reverse of this charming design depicts the dwarf and the shepherd boy as they come into the great halls beneath the mountain to discover Charlemagne in a deep sleep, his crown on his nodding head and his long beard wound around the great stone table before his throne. Next to him stands a soldier, also asleep, leaning on his spear. In the background we see the grand stairway that led them down beneath the Untersberg. The coin is struck in .925 silver and weighs 16 grams with a diameter of 32 mm. Three different qualities will be struck including proof, polished FDC, and uncirculated. Sales of the Untersberg coin began on 13th October 2010.